We've sifted through your questions about BlackBerry® PlayBook™ OS 2.0 (thanks!) 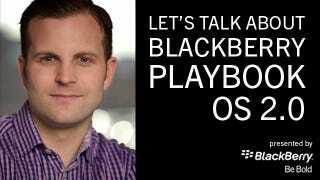 and Jeff Gadway, senior marketing manager for BlackBerry, is here in the post right now to answer them. So sit back and watch the questions and responses magically appear below. Got a question for Jeff now? Email it to chat@gizmodo.com.